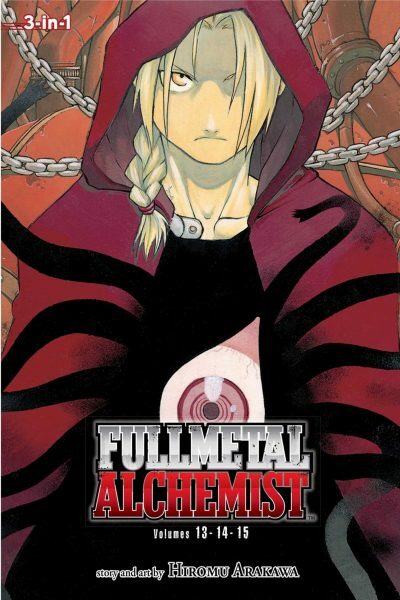 Viz’ Fullmetal Alchemist (3-in-1 Edition), Volumes 13–15 includes Volumes 13, 14, and 15 of the original Japanese manga1. Story and art are by Hiromu Arakawa; English translation by Akira Watanabe; English adaptation by Jake Forbes; touch-up art and lettering by Wayne Truman. The original manga appeared in 2006. I’m cheating somewhat here. No local source has the omnibus. I tracked down the individual volumes. That should suffice. Edward and Alphonse’s cunning scheme has paid off beyond their wildest nightmares. The brothers and their allies have managed to capture the homunculus Gluttony. But their triumph is brief. Once free, Gluttony sets out to even the score for its fellow homunculus, who died in the flames sent by pyromancer Roy Mustang. Gluttony’s plan succeeds beyond all expectation. Gone: expendable Prince Lin, Gone: Edward and homunculus Envy. Oops. Lin, Edward, and Envy have been exiled to a vast eldritch realm, one from which return is said to be impossible. Envy assures its fellow victims that a lingering death by starvation is inevitable. Unless Edward can figure out some unlikely way out of their current trap, all three are doomed. Escape itself is not without risk, since it will inevitably lead to a meeting with Father. The homunculi’s creator may let some of his visitors live simply because he has a future use for them. But not necessarily all of them. Meanwhile, Roy returns to headquarters and threatens to expose Fuhrer President Bradley as a homunculus. Bradley is oddly unconcerned. Bradley has held his position for decades; all his high-ranking officials are unshakeably loyal. They wouldn’t care if their leader were to be revealed as a monster. Perhaps they already suspect that he is. Just in case all this isn’t depressing enough, there’s an extended flashback to the Ishbal War and the cold-blooded genocide that ended it. Or rather, the genocide that was the entire point of the war. The crime the Ishballians committed was to be vulnerable and potentially useful raw material for one of Father and Bradley’s side projects. Many of the ongoing characters were shaped by the war, either directly (Roy and his fellow soldiers were traumatized by their part in mass murder2; Scar is driven by a desire to get vengeance for his massacred people) or indirectly (supporting character Winry lost her parents in the war, to none other than Scar). As terrible as the war was, it was merely a prelude to the true atrocity the homunculi have planned…. A very very grim cliffhanger. I did not think that the manga would get this dark. And there’s still something like half the series to go. Fullmetal Alchemist (3-in-1 Edition), Volumes 13 — 15 is available here (Amazon) and here (Chapters-Indigo). Fullmetal Alchemist (3-in-1 Edition), Volumes 1–3 was reviewed here. Fullmetal Alchemist (3-in-1 Edition), Volumes 4–6 was reviewed here. Fullmetal Alchemist (3-in-1 Edition), Volumes 7–9 was reviewed here. Fullmetal Alchemist (3-in-1 Edition), Volumes 10–12 was reviewed here. 2: Obviously not as traumatized as their legions of dead victims. Yeah, FMA gets WICKED dark before it gets lighter, and it looks pretty grim for most of its length. But as the mangaka herself promised early on "in the end, everyone will get what they deserve".